Quick overview Uncovers a different way to understand health by exploring the physical, social, mental, environmental, and spiritual dimensions that lead to or result from occupation. This book is useful for clinicians and students of occupational therapy, as well as other professionals working in public health. A significant and core text in occupational therapy for more than 8 years, Dr. Ann Wilcock's revolutionary "An Occupational Perspective of Health" has been updated and enhanced into a much-anticipated Second Edition. 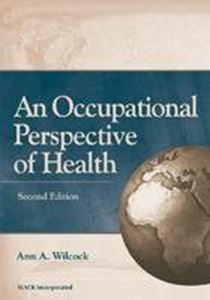 This unique text that examines the relationship between occupation, health, and ill-health explores the occupational experience within populations and offers more information critical to the practice of occupational therapy. Based on extensive studies of human history and occupation, Dr. Wilcock takes a holistic approach of health in line with that of the World Health Organization, examining the necessity for occupational therapists and their role in promoting health and well-being for all people. "An Occupational Perspective of Health" uncovers a different way to understand health by exploring the physical, social, mental, environmental, and spiritual dimensions that lead to or result from occupation. Dr. Wilcock takes a global perspective by approaching health from this angle, rather than just considering medical or social factors. The text considers the growth, development, and enhancement potential of involvement. This valuable resource supports and explains the historical and rational foundations of the advancing field of occupational therapy, by showing the link between occupation and existence. Addressed in this edition are: a conceptualization of health in the past, present, and future; the role of occupation in human life, health, and survival; occupation as a positive or negative influence on well-being; the potential contribution of occupational therapy to current WHO public/population health objectives; and possible action for OTs to become recognized as health-promoting professionals at population levels. Clinicians and students of occupational therapy, as well as other professionals working in public health, will benefit from and relate to this admired and essential text.